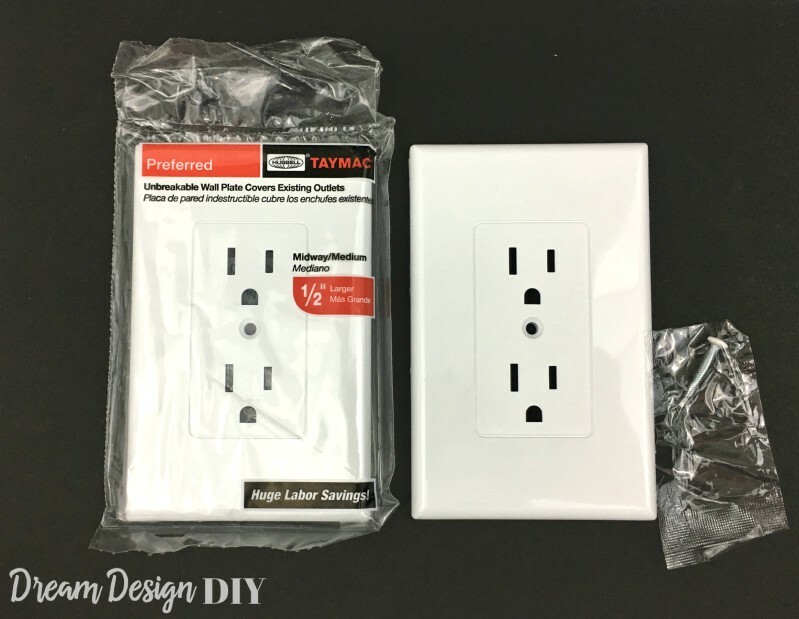 I found an amazing product that I am super excited to share with you that will fix mismatched electrical outlets and electrical outlet covers. When we moved into our 1970s home there were several major and minor things that needed updating. One of the minor updates was the electrical outlets and covers. I prefer electrical outlets and covers in white, however our house had the outdated almond color. 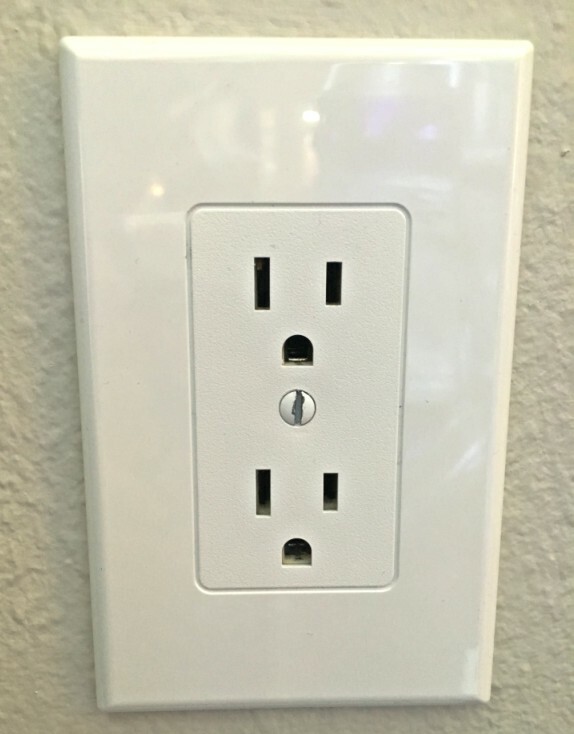 I bought several white outlet covers and installed them over the existing electrical outlets. 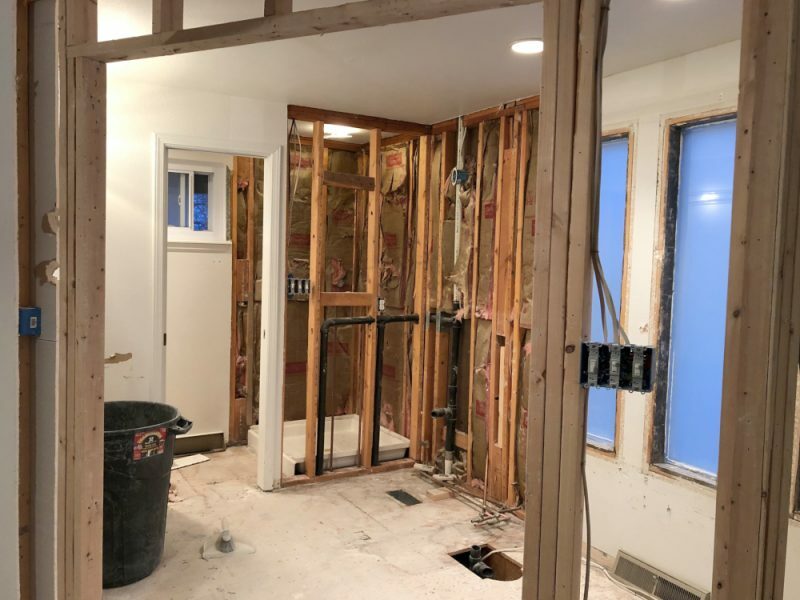 Ouch, not only is this an eye sore, but to make it worse some of my electrical outlets were dirty from years of use and some had paint on them from our painting projects. 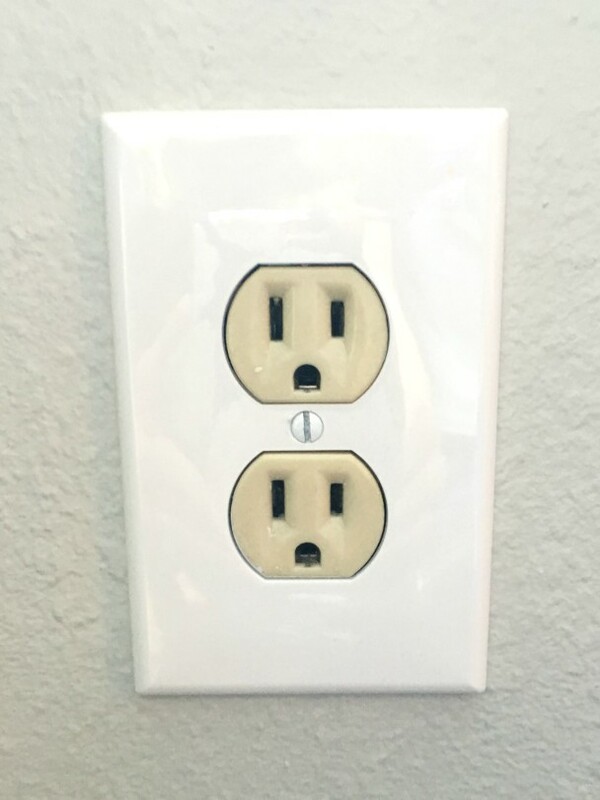 Regardless of the way they looked I was adamant on having white outlet covers so I was willing to live with the look. Then on a visit to Home Depot (of course it happened after I purchased a 10 pack of the other outlet covers) the heavens opened up and I found this amazing product! These outlet covers create a uniform, modern appearance and save time on labor. 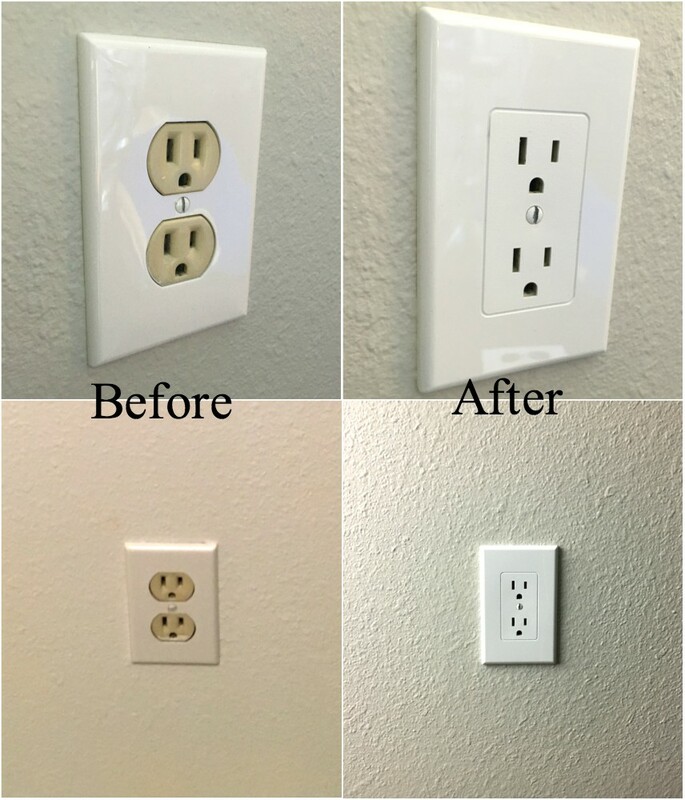 Instead of having to uninstall and unwire the old outlets, then install and rewire new outlets these covers fit right over the existing electrical outlets. 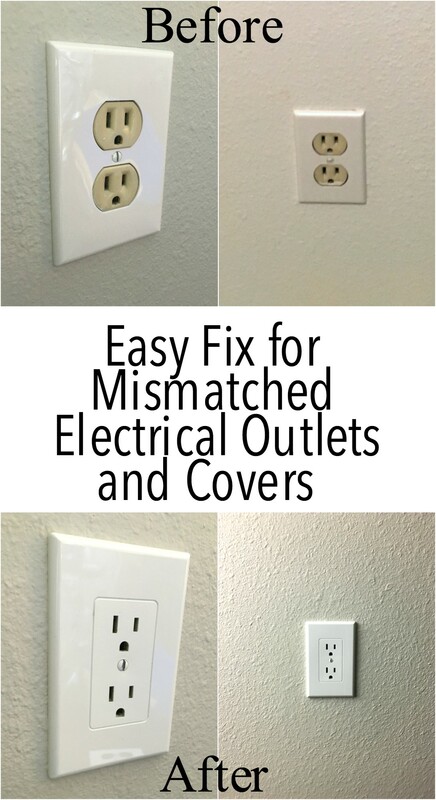 Super easy: just screw in just like you would the typical outlet covers. They retail for around $2.25 each. 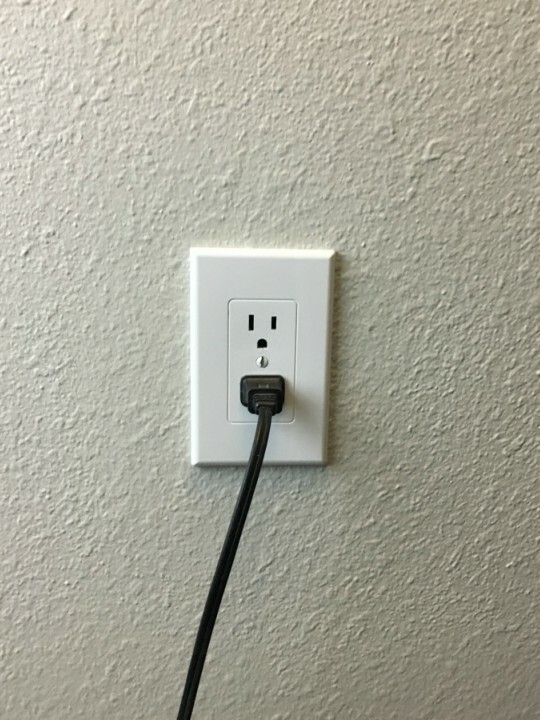 I have tested them on several outlets and I have had no problem with plugging in a cord. I am so happy with how they turned out and will be putting them over all my electrical outlets in our house. I hope you found this tip helpful. If so I would love for you to share on your social media. What are some of your favorite time saving tips? That is awesome! Now what about the light switches? Any suggestions? Glad to hear you like the tip. I wish I had an answer for the light switches. If I ever do I will definitely share. THANK YOU. I have been living without plug covers for a year now, waiting for an electrician to be available to switch out our old almond ones. I can’t express how this product is going to help me. I just ordered a box! Awesome Jeri Kay, so happy this has helped you. Yah and now you save money on an electrician and you can go to the spa instead :-). I wish I had an answer for you…nothing besides changing out the switch itself at this point. I have been asked this question a few times and will definitely be on the lookout. this is great…I need to replace some old working but ugly plugs and I was not looking forward to playing with the all the wires…perfect timing, I will get some today! So glad to hear this will help you! I really like the look, so crisp and clean. But, is there a remedy for switch plates? I really wish there was. If I find one I will definitely let you know. THANK YOU! I am moving to a new (older) home and this was the first thing I noticed. I’ve been wondering how I was going to fix this! Going to HD to buy tons of these ? Awesome Amber! Glad these will help you out! Hi there, thanks for sharing this useful article. Next week we are planning to renovate homes and electric lines. I don’t have any idea about electrician, while discussing with my friend, he suggested me to visit Manhattan moving companies for electricians. If you have any idea about it, please tell me. Thanks for your question. I am sorry but I don’t know anything about Manhattan Moving Companies. 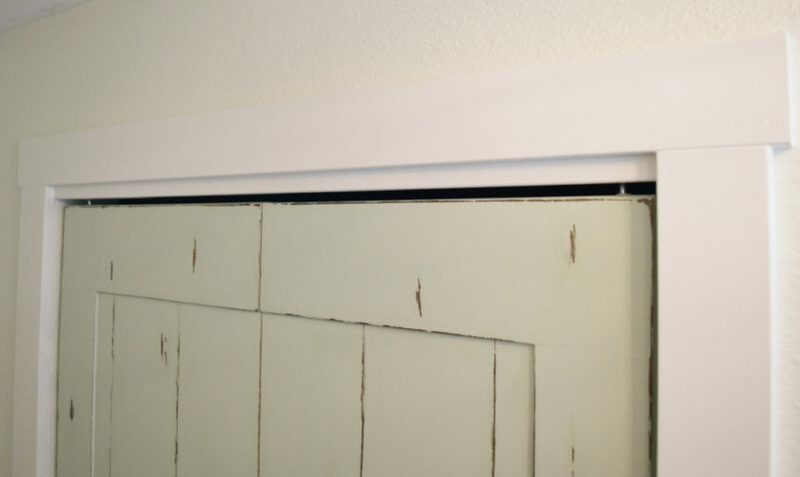 These outlet covers are meant for cosmetic reasons and if you are doing a house renovation, like you said seeking the advice of an electrician is definitely the best way to go. Good luck in your new venture! I wish I read your post before buying 30 covers that were the wrong color! What did you do about Almond color light switches? Sorry to hear that. I don’t have a solution to the light switch covers, I wish I did. If you find a solution please let me know. Do these work with the GFCI outlets? Thanks for your question. No these would not work with GFCI outlets. Just had to say a great big THANK YOU to you, Tiffany. This is exactly what I need in my kitchen. I suppose from all the grease a kitchen can accumulate and not changing the outlets out to new white ones when you update your kitchen is just some reasons that they turn that horrible yellow or if they were originally a tan color. We just bought our home and it was buildt in 1911 and I’d swear the kitchen outlets are the original ones ! Now I am on a mission to find this miracle of all miracle inventions here in my town. We have no Home depot or Lowes ? but we do have several hardware stores so I will be shopping like crazy tomorrow. Thanks again Tiffany. 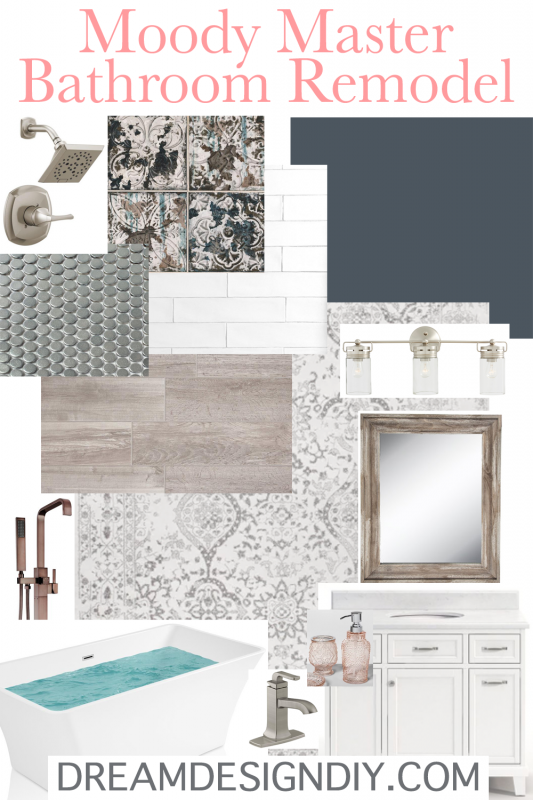 Happy diy-ing ! So happy this is able to help you. Enjoy your new home! 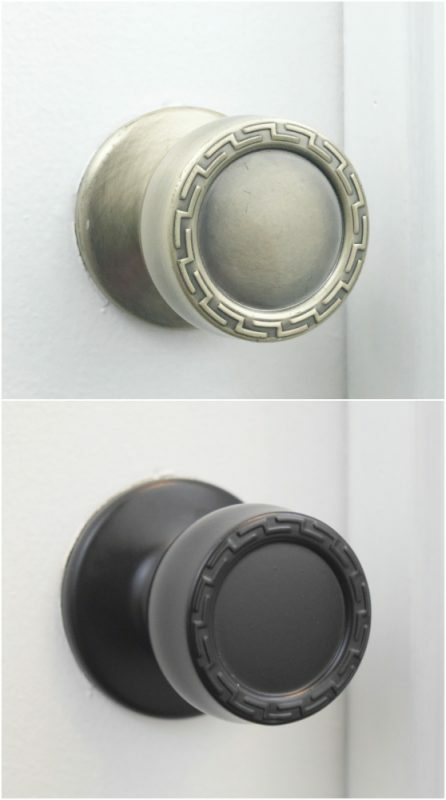 This same com-any makes a cover for the light switches too! On Home Depot’s website. Thanks for the tip. I was hoping they would. Is this the answer for the light switch? This is the first time I am seeing this…but I think you are right this might be the answer for the light switch. Good find and thanks for sharing! You are incredible!!! Thank you so much for sharing!!! Hi Beth you are welcome! I got these as Home Depot. It has been at least at year or more. Let me know if you are unable to find them there.